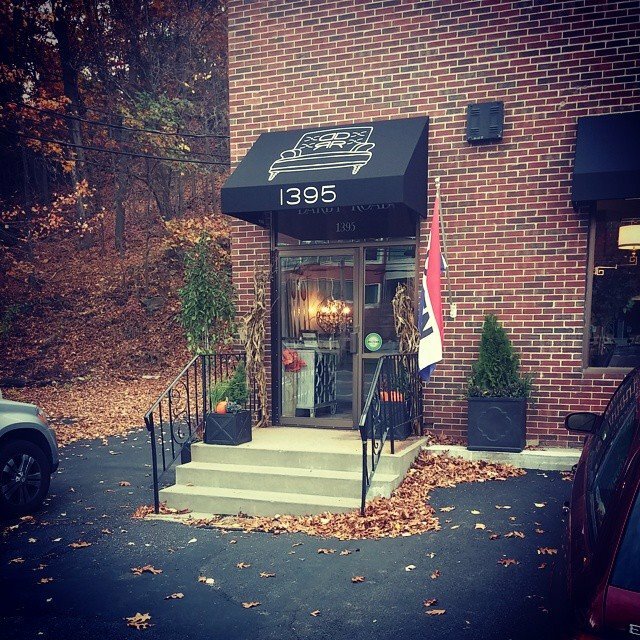 When Michelle obtained ownership of Darby Road HOME May of 2014 the showroom and store front was suffering from an identity crisis. Customers weren't quite sure what DRH was all about. Was is an antique store? Was it a consignment shop? Michelle knew, in order to thrive, she needed to build a brand and inform the potential buyer that DRH was indeed a full service furniture store that sold custom upholstery, in addition to case goods, art and thoughtfully chosen accessories. The logo needed to reflect that upholstery was DRH's focus and that is why she chose a classic upholstered chair as her logo. In addition, Michelle wanted the outside to look inviting. She was advised to not waste money on changing the awnings, but she couldn't be convinced. It also drove her crazy that there was no awning over the front door. She realized why the previous owner never put an awning over the front door pretty quickly! It required pulling a permit, having an inspection, and paying additional fees. But in the end it was the right decision. For one thing it keeps the rain from falling on her customers as they close their umbrellas before entering the store on rainy days. While the exterior is an ongoing challenge, the plants, new back-lit sign, and lighting in the windows has definitely made Darby Road HOME more inviting to the passing customer. Michelle is excited about the upcoming 1 year anniversary of owning DRH in May. Spring time will bring another round of small improvements. Once people enter the door they are pleasantly surprised that they decided to stop and see what Darby Road HOME is all about. The facade was without greenery or any signage to welcome clients into our store. 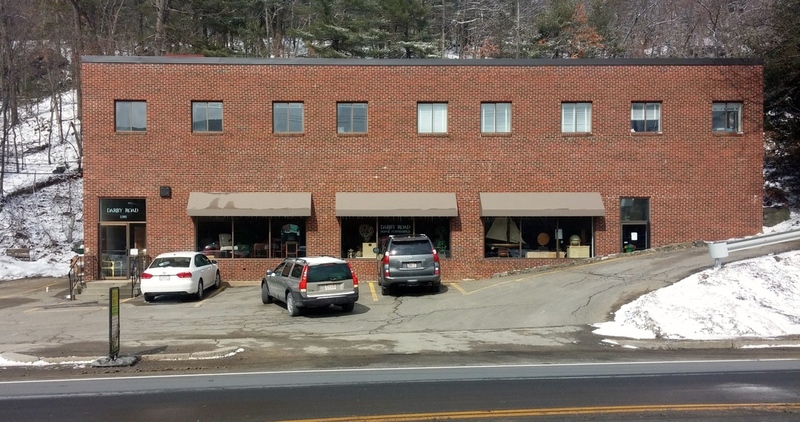 DRH recovered the fading brown awnings with black to frame the windows and give the storefront contrast. To recover the awnings, the frames had to be removed so that they could be stripped and made new. Black awnings were installed and they looked fabulous. Next step was to design the entrance door awning to match and unite the door to the windows. 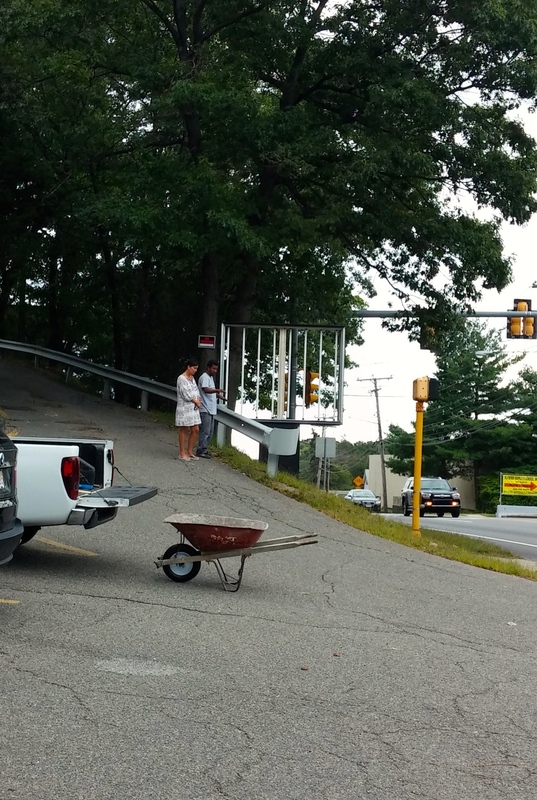 The final touch was to add a welcoming awning over the entrance door. We featured the street number and logo as identifying design elements. Underneath that banner was an existing sign that needed to be redesigned and fixed so that the DRH brand could be lit up at night and introduced to the passing traffic. This is where the light box had to be maintained to regain its function and stripped for the new lexan panels to be installed. The frame was painted black for continuity with the facade's color palette. DRH signage is complete! The brand was reimagined with an upholstered chair logo featuring DR in the tufting of the back cushion. 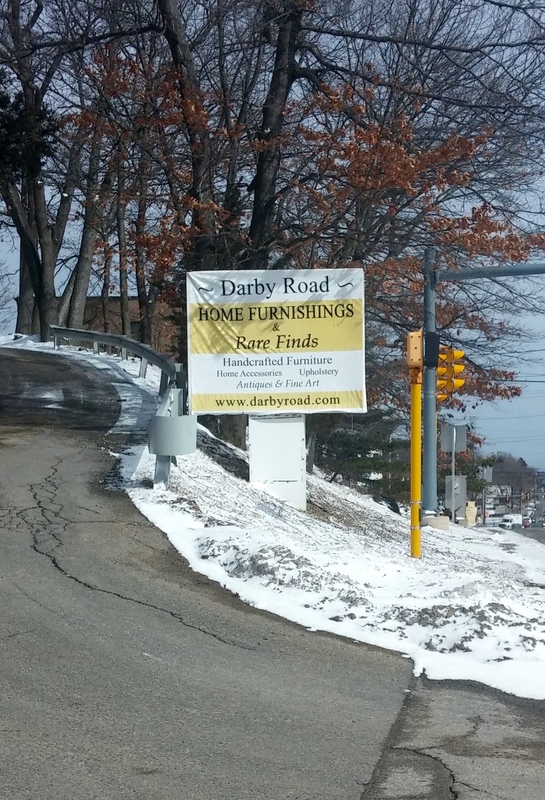 As custom upholstery is a Darby Road HOME specialty, the chair was the perfect icon to represent DRH services.